The Nokia RM-877 went calling on the FCC the other day, wearing AT&T's LTE bands (2,4,5 and 17). Other modes of connectivity included pentaband HSPA+ / WCDMA and quad-band GSM / EDGE. It also features dual-band Wi-Fi, NFC support and of course, it is Bluetooth enabled. While the phone was unnamed except for the model number, which is par for the course with FCC filings, the device is slightly longer and is wider than the Nokia Lumia 925. While the first thought that comes to mind is that this is the Nokia EOS, which is expected to be unwrapped July 11th during an event in New York, the second thought that comes to mind is also the EOS. That is because the documents mention the testing of the device with a camera grip, model PD-95G. Also tested was an optional wireless charging cover as well. Did the Nokia EOS just make it through the FCC? I agree this would be my next phone, when its out, the 925 has an amazing camera, cant imagine this one, maybe Pureview Version 3 and maybe 7 lenses? With all the hype the EOS camera is getting, the sensor size must be at least 1/1.7" or it will be a major disappointment. common stuff dude, nokia n8 have 1/1.83 which is really old phone 2010. and Nokia 808 have really huge sensor 1/1.2, then why u saying the sensor size must be at least 1/1.7. EOS will have huge sensor like 808 or maybe even huge1/1.1 or 1/1.0 who know. @akki20892 I said 1/1.7" to match the current high end Canon point-and-shoots like S110 and G15. 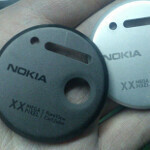 The quality of Nokia EOS lens will also be a big factor. how about a "DROP-Test" ? And that's why Nokia phones are tough. I dont hate bezels. yeah who cares about your comment. then what are doing on Nokia article ? yehh right, who cares.